← A LETTER TO AN ADVERTISER – a little old lady destroying the joint. The view of the Acropolis from the New Acropolis Museum. I cannot begin to tell just how bloody hot it was. Athens in the middle of summer can be challenging at best. We approached our summer Athens stay by scheduling outside activities in the morning, and air conditioned splendour found in all museums and galleries in the afternoon. 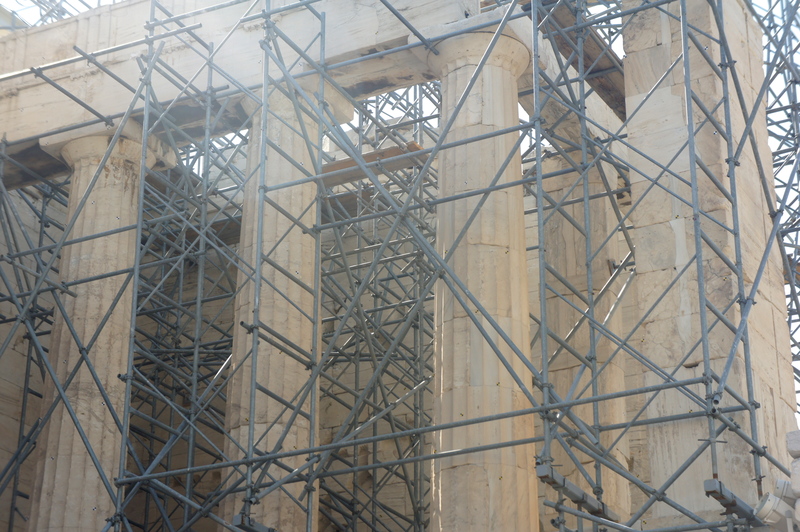 Work on the Parthenon, Acropolis. Visiting the Acropolis was seen as yet another of those challenges. It was so tempting not to revisit. We had been there 29 years ago, and how much could an ancient place full of temple remains have changed in that time? We decided not to be wimpish. The idea was to climb to the top of the acropolis in the morning, have lunch and wander around the New Acropolis Museum thus occupying the remainder of the day. It was a Monday. Of course, the New Acropolis Museum is not open on a Monday. So much for the 10,000 tourists who arrived that morning on boats and whose first stop was going to be the Acropolis, and thank God for the National Archaeological Museum which opens on a Monday afternoon. So armed with a gigalitre of water we walked to the top of the Acropolis. What I found fascinating was watching the workers involved in the restoration of the whole site. So many of the statues and other bibs and bobs still being discovered on the site have been taken down to the new museum for restoration and permanent display. Large section of the columns, plinths and mantles are being restored, replaced and cleaned in all the temples. 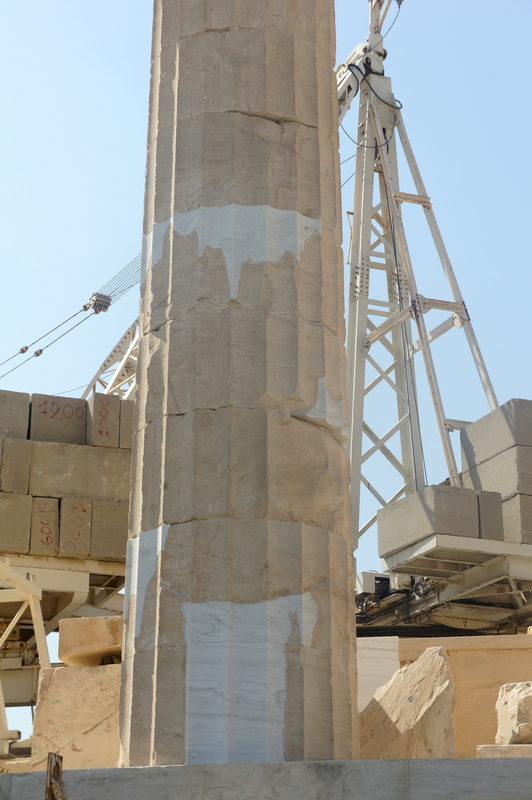 In some instances sections of the columns are being replaced. Stone masons with skills thought long gone, chisel and sand large blocks of stone with the precision required for the finished piece to seamlessly sit in its new home, underpinning vital parts of the ancient structure. When we came down from the top the temperature was 40C and we had drunk the gigalitre of water. We were bitterly disappointed at the closure of the museum that would have expanded and explained so much of what we had seen that morning. So we found a tavern with a canopy of dense grape ivy, and huge fans that spit water all over you. Bliss. An early light lunch helped heal the wounds. The tavern’s proprietor, via the help of google in Greek and three waiters all talking simultaneously over a lap top screen, gave us the directions to the National Archaeological Museum to visit instead. But that’s another story. Aerial of New Acropolis Museum. 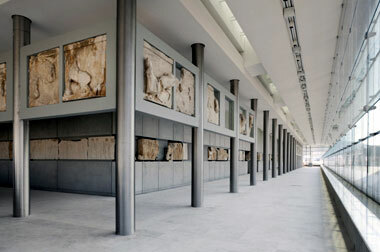 The Parthenon Gallery, New Acropolis Museum. important to Athens as the Opera House was and is to Sydney. It is modern and makes no apology for reflecting the era in which it was conceived and built. 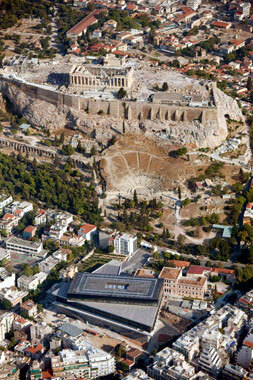 The glass provides large shafts of natural light and the most amazing views of the Acropolis. On the top floor it seems so close you have the feeling you can almost reach out and touch it. The Museum is a building that allows the exhibits to be displayed well and with innovation. 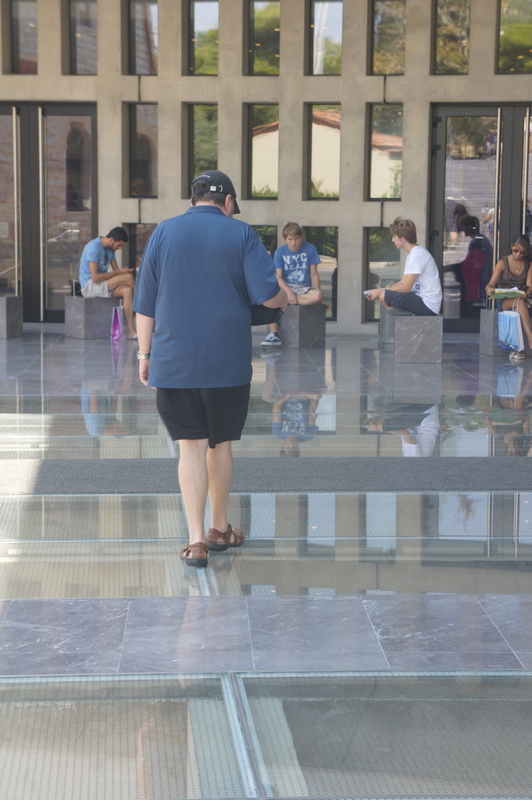 The visitor can easily walk through the history of this site and the way the artifacts are placed mean a logical and understandable meander. The thing that pissed me off was not being able to take photographs, even without the flash. There is so much natural light a flash isn’t necessary. The only place you can take pics is on the top floor where the residue detritus of the Elgin (though don’t call them that when in Greece) Marbles are placed in the midst of reproductions of those exhibits now taking pride of place at the British Museum. You are constantly reminded of what is missing, especially when there are glass walls showing you a remarkable vista of the home from where they’ve come ‘or’ (been stolen) ‘or’ (been relocated). Walking on glass. The entrance to the New Acropolis Museum. The museum’s entrance is placed well back from the road. As interesting as the museum is, what I personally found mesmerizing is what is happening under the building. Actually, it is what is happening under the whole footprint of the museum’s site. 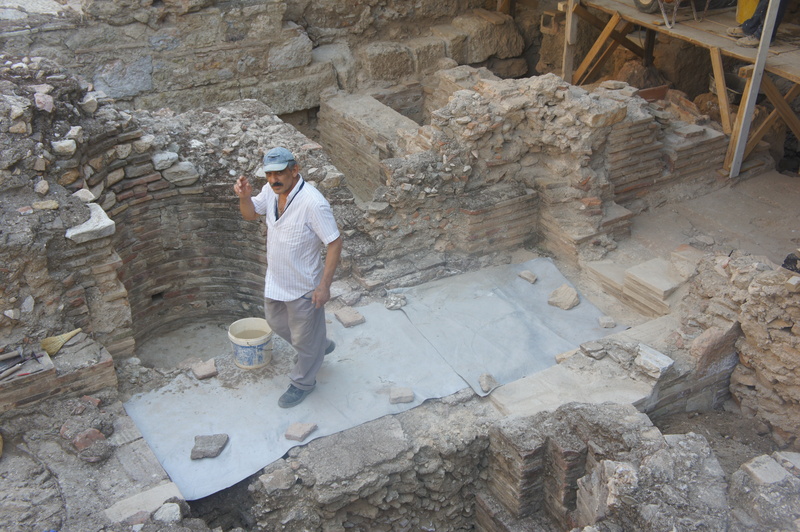 While excavating for the foundations of the building an entire suburb of ancient Athens was uncovered. There was a major kerfuffle as to what should be done with the cottages, homes, streets of shops, bath houses, water systems, the whole kit and caboodle, all in a reasonable condition, given that they have been covered for more than 2000 years. 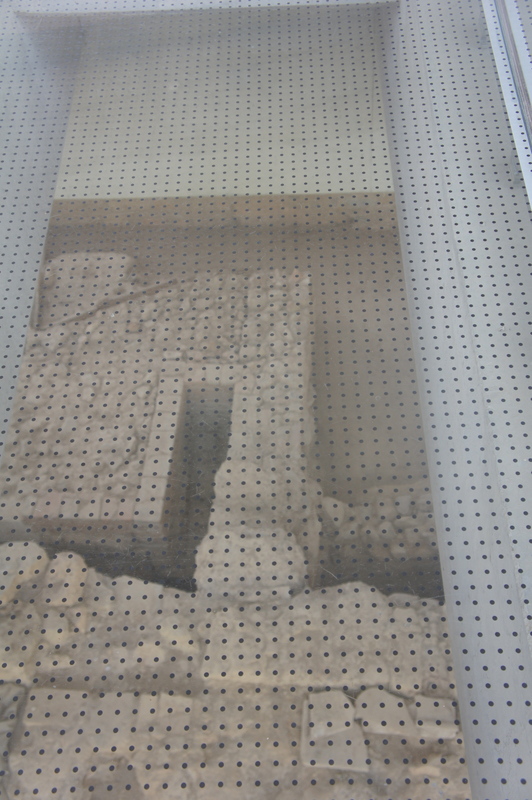 A view down below at the excavations seen through glass. A work in progress. Excavations under the New Acropolis Museum, Athens. 20-30 feet off the deck. He persevered, but it did make him feel slightly nauseous. It didn’t worry me a jot so I wasn’t conscious of how far down I was looking. I was too busy working out floor plans and exclaiming over drainage systems. 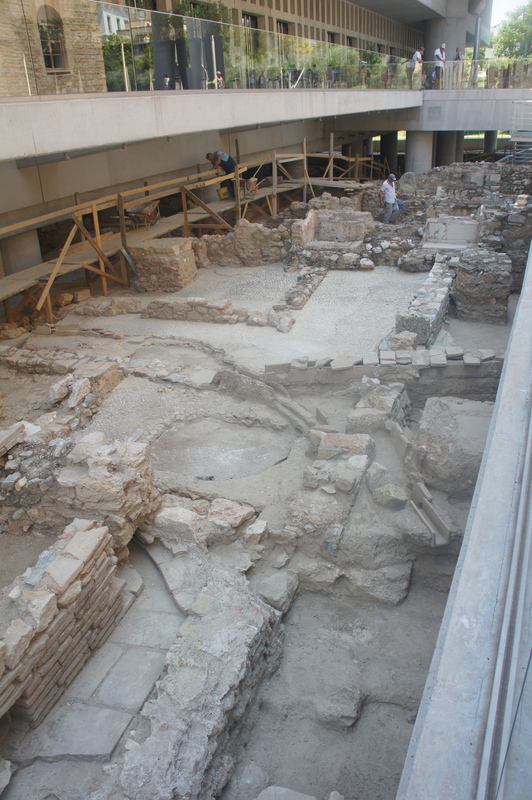 The large open well showing excavations in progress under the New Acropolis Museum, Athens. Photo by me. Lunch was on the 4th floor cafeteria with a huge outside area which looks at the Acropolis and the surrounding and seemingly very ritzy residential area. The food is adequate, the coffee excellent, the view worth it. If you are a fan of Museum Shops prepared to be be disappointed, although they did have a impressive reproduction of a bust of Sappho. Because I was unable to take photos of the exhibits in situ I have included some photos from the official Museum site and Wikipedia (bless ’em). 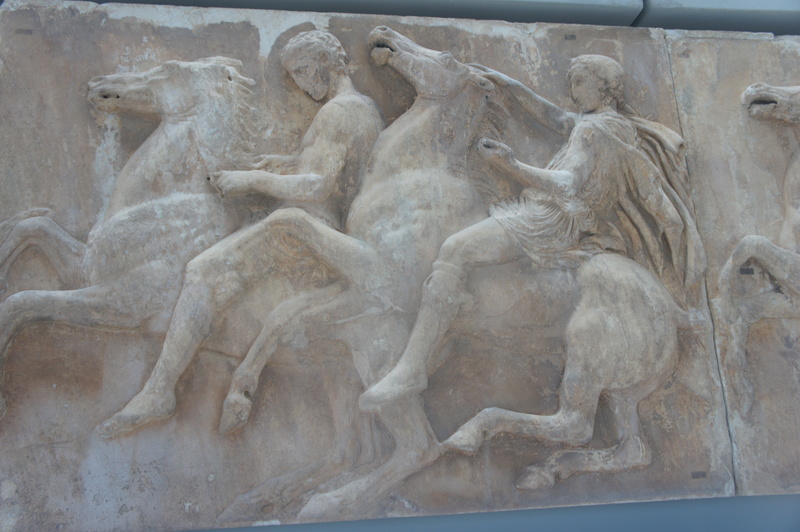 Part of the original Parthenon Marbles, New Acropolis Museum, Athens. This is the link to the official site of the New Acropolis Museum. What this link does is show you the plan of how best to walk through the Museum. It’s laid out in galleries and makes it easy. This is a link to a mountain of photographs from the New Acropolis Museum. You may like to wander through it. Do yourself a favour and look at the slideshow of 16 amazing photos of the New Acropolis Museum as published in the New York Times. NB: The New York Times link I can’t activate on my blog but it works. Copy or cut and paste the bloody thing. There are 16 of the most magnificent photographs presented in a slide show. Once you’ve seen them you’ll understand why I compared the importance of this building for the cultural soul of Athens and the on-going campaign for the return of the Elgin Marbles, to the Sydney Opera House. This is a link to Christopher Hitchen’s piece on the New Acropolis Museum. He wrote this article for for Vanity Fair not long after the museum opened. I’ve included it because he makes a case for the return of the Elgin Marbles far more eloquently than I ever could. His reaction is intellectual, mine far more physical. This is a link that looks at the site from the architect’s perspective. It includes schematics, plans, as well as other more technical information that may be of interest. The next blog posting is on the National Archaeological Museum. You can go ho hum if you like but it contains a swag of stuff on the Antikythera Wreck which is on exhibition there. Posted in Food, Politics, Sport, Kitchen, Reviews, Travel and tagged Athens., New Acropolis Museum. Bookmark the permalink. How wonderful to be able to walk among the greats of Greece, the cradle of Western Civilization. I think I would be in such awe that I could not move. Plato. Socrates. Aexander the Great, and so many more. The art. The buildings. I would be in awe. How nice of you to write of your expereinces. You were my guide as i sneaked along behind you. You made my day. I am really interested in what is revealed under the surrounds of the Parthenon, because these elevated areas were often places of religious veneration. As you say, it must be difficult to perform the archaeological work, given the circumstances. The Museum seems perfect for the job. I guess you didn’t try arguing with the taxi driver about the aesthetics and functionality. I wouldn’t. Perhaps the bearers carrying the first tourists to the top when the Parthenon was built 2000 years ago also thought that it wasn’t a suitable structure! I marvel at the skills of the ancient Greek architects, engineers and artisans.It’s wonderful that so much is preserved. Can you imagine them in situ at the height of their glory, surrounded by life and noise and colour? Thanks for taking us through. Nothing beats being there though, does it? I like your writing style. Stay with it. Oh, and I guess the no-photos rule is so you have to buy the postcards. Or do they have picture CDs on sale these days?